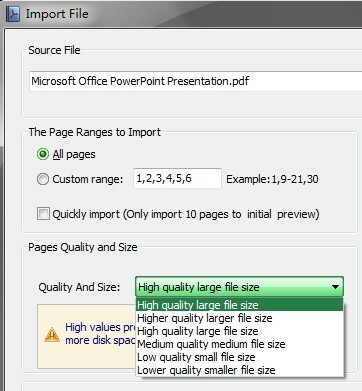 Use Page Flip Publisher to set page quality and size of import PDF. Yes, with use our powerful A-PDF to Flipbook software, you can set page quality and size of import PDF file. Step3: Select template from template list, local templates and online templates provide for you. Click Next button to enter into “Import File” interface. Step4: Browser PDF from your computer, set page quality and size under Page Quality and Size bar. Step5: Click “Import Now” button to starting your flipbook travel.